How do I clean slides? This post is to share with you about cleaning slides. You do not want to clean them with water as this can remove your image from the slide. The simplest method is to wipe them gently with a microfiber cloth which should remove any dust. 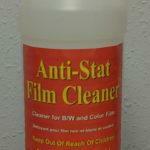 If your slides are more dirty than that we recommend purchasing Anti-Stat Film Cleaner. It is somewhat expensive and it is rather aromatic so you’ll want to use it in a well-ventilated area. Moisten a smooth microfiber cloth with the film cleaning solution and then rub it on your especially dirty slide. You can use it on both sides of the slide. If you’d rather not do the cleaning yourself bring (or ship) your slides to Leave A Legacy and we’ll do it all for you. We hope that this explanation has helped you learn how to clean your slides.